It has been nearly a decade now since Paul McKee’s Northside Regeneration plan was first made public. It was July 2005 when Michael Allen disclosed properties owned by Blairmont Associates and affiliated companies. At the time I was in real estate and was able to search & download bulk property records, which I’d given to Allen. At that point McKee had been quietly acquiring properties for a couple of years. In the years since McKee has received a go ahead from local & state official, and survived numerous lawsuits. The lawsuit says that the loans, originally issued by Corn Belt in October 2007 for $12 million, went into default in October 2009, but that McKee, his trust, NorthSide and Multibank entered into a forbearance agreement, in which Multibank agreed not to collect on the notes if the forbearance agreement was followed. Unlike the 2008 collapse of developer Pyramid Construction, I think McKee will find a way to survive. At this point, however, we need McKee to thrive — not just avoid the collapse of his plan. The areas where he has bought properties need to see buildings renovated and new construction going up. Sticking with McKee is a gamble — but backing his creditors would also be a gamble. If only the city had put together a plan to attract employers, developers to unwanted/underused sites like Pruitt-Igoe and the 22nd Street Interchange. City planners could’ve marketed the area where the Stan Musial Veterans Memorial Bridge meets a rebuilt Tucker at Cass. 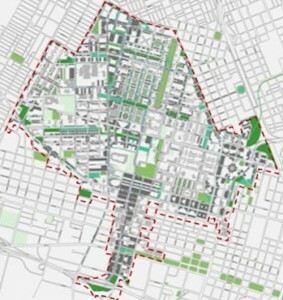 Instead the city withdrew from planning, leaving the field open to private for-profit interests. 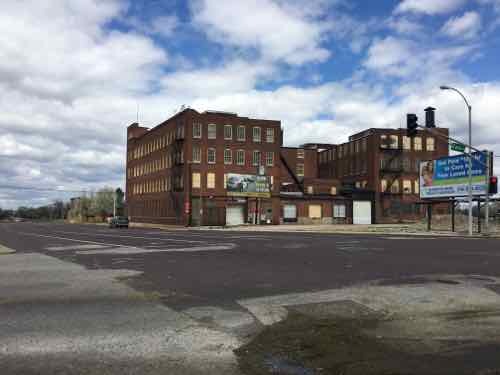 Let’s assume the National Geospatial-Intelligence Agency selects the 100-acre site in North St. Louis, over three others in the region, for its new campus, see Urban Renewal Officially Ended In 1974, Still Alive In St. Louis. Will this help or hinder the redevelopment of the surrounding blocks? The planned clearance of 100 acres will leave a one block wide strip across 22nd, to the East. 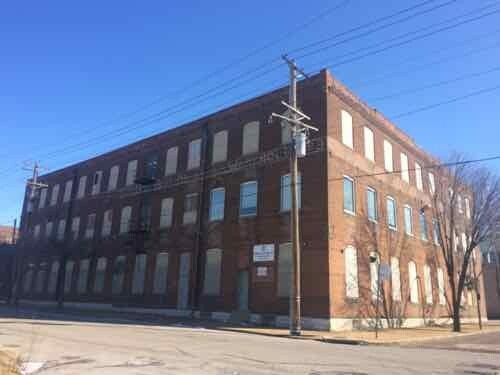 To the South is Cass Ave and the former Pruitt-Igoe site, to the West is the excessively-wide Jefferson Ave. To the North will be the backs of properties facing St. Louis Ave.
At 22nd & Mullanphy St is a vacant warehouse built in 1889. 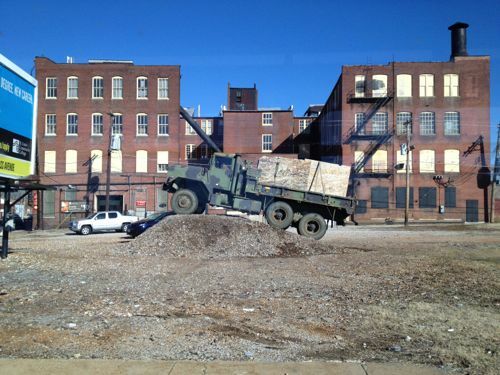 This is owned by the St. Louis Housing Authority. In the same block is the former Falstaff Brewery — successfully converted to housing a couple of decades ago — including new construction & adaptive reuse. Click image to view the Falstaff project. Two blocks north at Madison you get these three buildings owned by Paul McKee’s Northside Regeneration. The corner was built in 1904, the two on the right in 1890,. Neither of these corners are architectural gems, but their age is a nice contrast to already built infill and the secure fortress of what the National Geospatial-Intelligence Agency would build. The old cast iron storefront at Madison might house a coffeehouse/cafe — a place for the new employment base to walk to for lunch. This could be a chance for an existing resident to become an entrepreneur, hiring others from the area. I don’t know if the National Geospatial-Intelligence Agency works without outside contractors, if so, the 3-story 19th century warehouse could become office space. Residential is certainly another option. If we’re going to raze a 100 acre swath of land adjacent to the long-vacant Pruitt-Igoe site we should begin thinking now about how to improve the edges. If the National Geospatial-Intelligence Agency doesn’t pick this site we’ll be area on ideas for the area, with other businesses perhaps being interested in the vacant blocks within the 100 acre site. Great potential exists, but the private market often overlooks these less common areas that require greater creative thought. After World War II, urban planners (then largely concerned with accommodating the increasing presence of automobiles) and social reformers (focused on providing adequate affordable housing) joined forces in what proved to be an awkward alliance. The major period of urban renovation in the United States began with Title I of the 1949 Housing Act: the Urban Renewal Program, which provided for wholesale demolition of slums and the construction of some eight-hundred thousand housing units throughout the nation. The program’s goals included eliminating substandard housing, constructing adequate housing, reducing de facto segregation, and revitalizing city economies. Participating local governments received federal subsidies totaling about $13 billion and were required to supply matching funds. Jane Jacobs’ 1961 book The Death and Life of Great American Cities rebuked the ongoing land clearance policies advocated by supporters of urban renewal. By the late 1960s one of St. Louis’ most prominent urban renewal projects — Pruitt-Igoe — was a disaster. Before the 20th anniversary the first of 33 towers were imploded in 1972 — urban renewal was unofficially over. But forty plus years later the St. Louis leadership continues as if nothing changed. The old idea of marking off an area on a map to clear everything (homes, schools, businesses, churches, roads, sidewalks) within the red lined box remains as it did in the 1950s. The message from city hall is clear: don’t invest in North St. Louis because they can & will walk in and take it away. What are the scenarios at this point? Businesses, residents, churches, etc are displaced. A 100-acre swath is purchased and cleared. The federal government builds a fortress-like campus, few workers would leave at lunch. No benefit to the surrounding neighborhoods, access to public transit cut off by monolithic campus. Adjacent areas now threatened as the next target for clearance, further eroding those areas. Fire Station Number 5 would remain, but because of the new campus, firefighters would be unable to quickly reach the area to the West of Jefferson/Parnell. 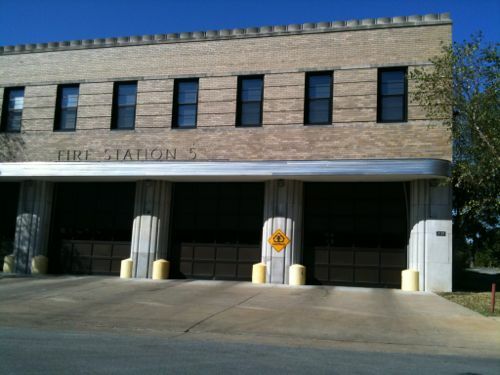 Fire Station 5, in the narrow strip between St. Louis Place Park and the proposed campus, would be blocked to the West. Nobody buys into this area because it’s now a known target area. It declines further because it’s a known target area. It’s taken later for some corporate campus. 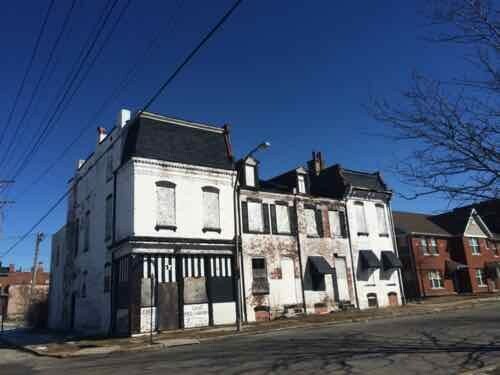 The city/community works with Paul McKee, existing businesses and property owners to develop a plan to revitalize the Cass & Jefferson/Parnell corridors and to coordinate with a new street grid in the long-vacsnt Pruitt-Ogoe site. The existing street grid is left fully intact. Infill planned with a variety of residential units with a concentration of retail & office at Cass & Jefferson. But this won’t happen, St. Louis is forever stuck in the middle of the 20th century. Clearance for a new stadium and a QuikTrip are other current examples. It has been nearly 70 years since St. Louis adopted Harland Bartholomew’s City Plan and we’ve yet to stray from the thinking he outlined. 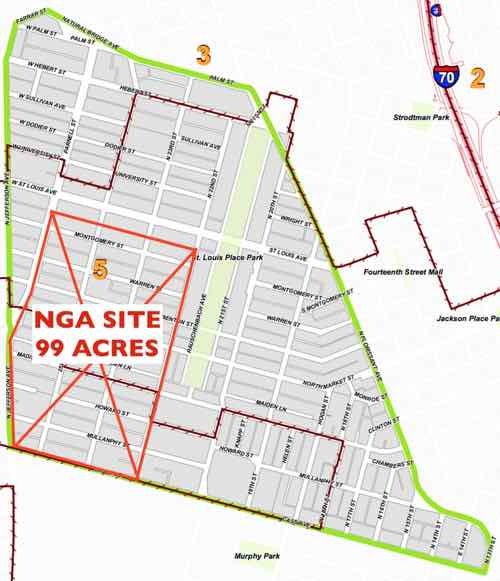 Q: Should the City of St. Louis use eminent domain powers to assemble a site if the National Geospatial-Intelligence Agency selects the city option? We shouldn’t be willing to raze 100 acres to retain earnings tax revenues. If there was hope the campus would help the surrounding area it might be a fair tradeoff, but it’ll further deteriorate and isolate. Still, this urban renewal mindset is so engrained I’m not sure we’ll ever break free of it. Perhaps I should just give up? Last week readers at least 135 readers took the poll, indicating what they’d like to see as priorities at Paul McKee’s NorthSide Regeneration project. Here are the results in the order the software listed, two answers tied for the the top spot. I agree with most of the items in the top 10, very glad to see “Good Walkability” tie with “Jobs for locals: long-term work at various pay levels” at the top, followed closely by rail transit to downtown and urban form. I do take exception with one item: architecture. I was disappointed “Architecture that IS historic looking” got 43 votes, but “Architecture that is NOT historic looking” only got 11 votes. Buildings in 2014 trying to look like they’re from 1914 end up looking cheesy. Other cities do a great job building new urban buildings that relate to the sidewalk and neighboring buildings without being faux historic. We need to drop the expectation that every new building be given a bit of red brick on the front and a fake mansard roof on top.